Highnam Business Centre is situated fronting the B4215 (Gloucester to Newent road), with vehicle access off Two Mile Lane. The Business Centre is approximately 1 mile north-west of the A40, giving access to Gloucester, the northern bypass and ultimately Junction 11 of the M5 motorway. 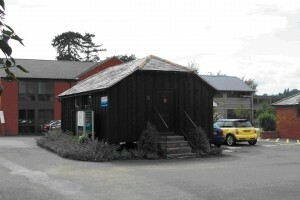 Unit 17 is a unique development at Highnam Business Centre incorporating open plan office accommodation with toilet and kitchenette. The unit benefits from double glazing, perimeter trunking incorporating Category V wiring, fluorescent strip (Category II) lighting, electric heating and car parking. The unit provides the following net internal floor areas. The unit has mains electricity and water connected which the tenant would be responsible for. We confirm we have not tested any of the service installations and any occupiers must satisfy themselves independently as to the state and condition of such items. Unit 17 is available by way of new internal repairing lease for a term of years to be agreed and including a service charge. Unit 17 – £5,000 per annum inclusive of Service Charge. Highnam Business Centre has been elected for VAT, which will therefore be charged on the rent and other Landlord services. We recommend potential tenants establish the VAT implications before entering into any agreement. Interested parties should make their own enquiries from the local authority to ascertain the rates payable. A change in occupation may trigger an adjustment of the rating assessment.